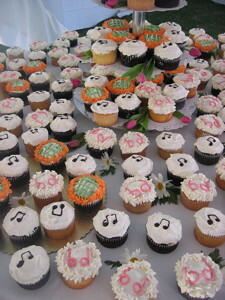 musical cupcakes, originally uploaded by candiedyams. I snagged this picture from the Biddy Blog where the Lascivious Biddies blog and podcast. This picture is from Biddy Deidre's wedding who just got hitched two weeks ago. And check out Biddy Lee Ann's Cupcake Interview. Now you can get their CD, "Get Lucky" on iTunes.